ANTIQUE TCHEROT AMULETS/KITABS FROM MAURITANIA. Not all of these may have been made by Tuaregs, as the workmanship is quite similar between Tuareg and Mauritanian smiths, although the latter usually have better equipped workshops and tools. 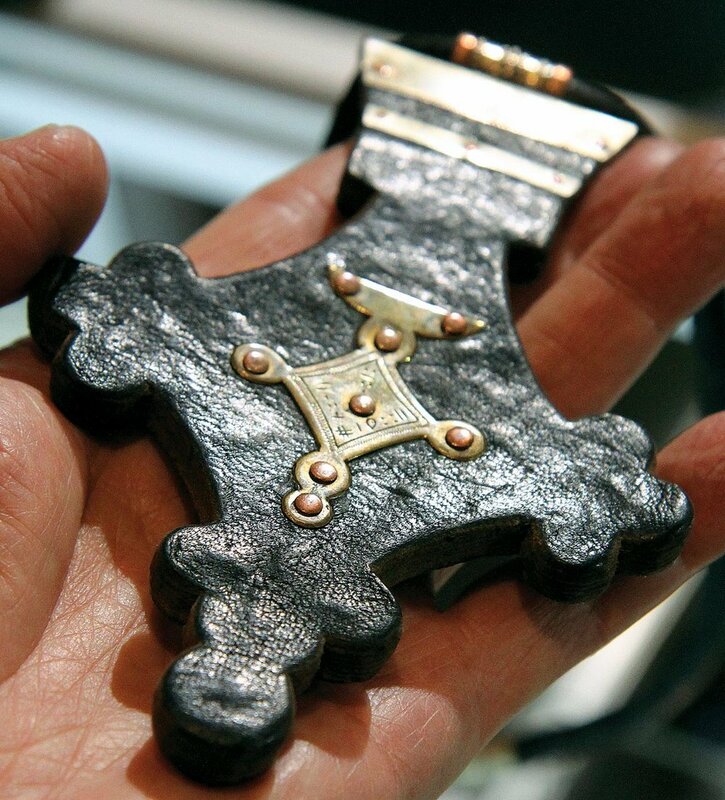 The square tcherot amulets are of either silver, or silver and copper, with fine crafting, especially the engraving. Because silver wears easily, many of the engravings are now barely visible. Whether the metal is precious, like silver, or base, like copper or brass, does not determine how well it is worked. An intricately and beautifully engraved tcherot from Niger is entirely of brass (Benesh-Liu and Liu 2007: 71). Often, the silver panels are sweated onto the copper, and most are cold-constructed, with bezels holding the front in place. The use of decorative silver balls is also seen in tcherots from Niger (Gabus 1982). Among my favorites are those inspired by and shaped like a stylized gerba or their traditional goatskin water containers (Schienerl 1986). Most are made of steel, onto which are sweated panels of silver, copper or bronze, with copper wire loops. Some may have been covered with leather, with cutouts for the metal, decorative panels; one on this page, which is new, has this leather treatment. These range from 3.0 to 6.6 cm long. Courtesy of Brinley Thomas (small gerba shape in silver and copper) and Jürgen Busch. The Tuareg are a nomadic, Berber or Tamazight/Tamasheq speaking people, most of whom live in the Saharan and Sahelian regions—southern Algeria, western Libya, eastern Mali, northern Niger, and northeastern Burkina Faso (www.encyclopedia.com/social-sciences-and-law/anthropology-and-archaeology/people/tuareg). Gabus (1982) adds Mauritania, confirmed by Hillary and Abdou Louarti (pers. comm.) for eastern Mauritania and a bit of Nigeria. With the current African diaspora, Tuareg now also live in Europe and the United States. 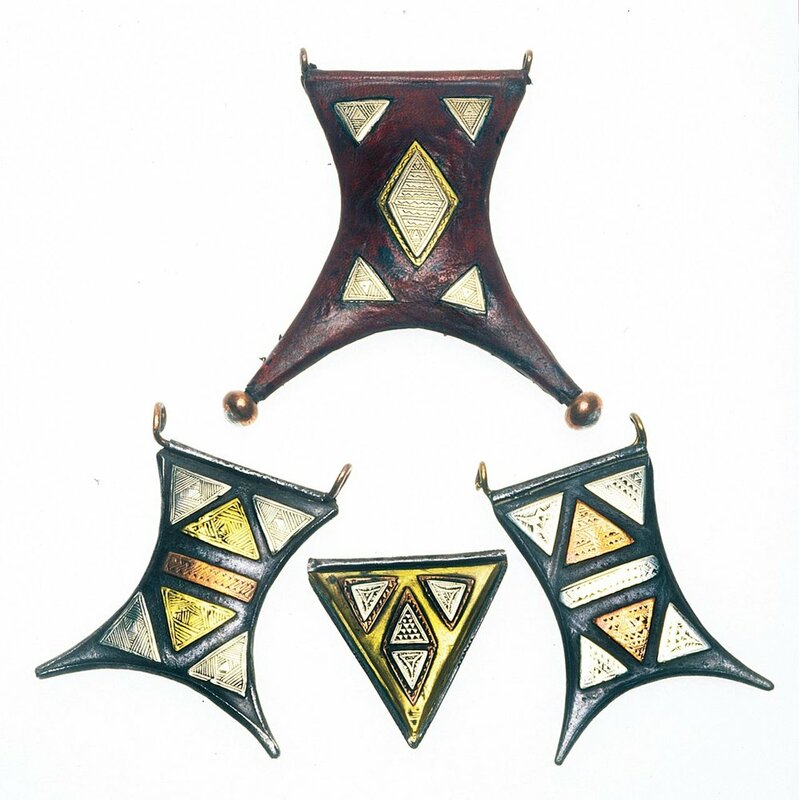 SQUARE, CROPPED TRIANGLE AND TRIANGLE TCHEROT AMULETS FROM MAURITANIA. Two are of steel, one of tin (?) and copper/silver and one of brass, copper and silver. All are finely engraved and have engraved geometric plaques, many triangular, sweated onto their bases and cold-assembled via bezels. Note the rolled tube, used for holding the bent wire copper loops. Again, there is the dual role of the amulet shape and its decorations offering protection, especially regarding the triangular shapes. These are 3.3 to 5.1 cm high. THREE GERBA AND ONE TRIANGULAR TCHEROT AMULETS. Largest gerba-shaped one is new, of copper covered with leather, with cutouts revealing the white metal/brass panels, poorly engraved, with copper tube and large copper/white metal balls at the tips of the stylized goatskin form, 9.5 cm high and smallest 4.4 cm high. Lower ones are antique, of steel, silver, copper, and/or brass. 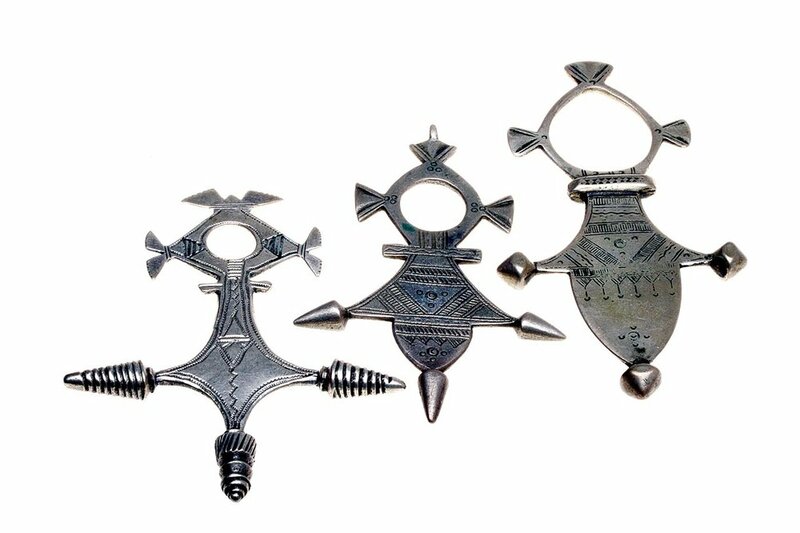 THREE VINTAGE CROSSES OF AGADEZ AND IFERWANE. Mauritanian, of cast silver alloy, then tooled; note that engraving is worn on right-hand specimen, which is engraved on reverse/obverse, as is middle one. One to left newer, only engraved on obverse; 7.0 to 8.4 cm high. According to Creyaufmüller (1983), the upper and lower portions of such crosses have at least 20 and 28 variations respectively. Courtesy of J. Busch. THREE CROSSES OF AGADEZ OR INARANGANAK. Strung on wool; traditionally worn with 3 - 5 crosses, also on cotton or synthetic fibers, according to Ethnic Embellishments. Courtesy of J. Busch. Photographs by Robert K. Liu/Ornament Magazine and Ethnic Embellishments, where noted. For a nomadic people, the Tuareg have a large and varied assortment of jewelry, worn from head to ankle, as well as perhaps the most diverse use of materials and techniques among African jewelers. Unlike jewelers of the Mahgreb, Tuareg smiths or inadan wan-tizol (makers of weapons and jewelry) have a very simple tool kit, suited for an itinerant life and reminiscent of early Native American jewelers. Tuareg jewelers are now very active in Africa and abroad (Benesh-Liu and Liu 2007, Cheminée 2014, Liu 2017). Jewelry or jewelry components often attributed to the Tuareg are also worn by other tribal groups, such as the Bella, Fulani, Moors, and Wodaabe, as shown in photographs by Fisher (1984), as well as Mauritanians (Gabus 1984; Hillary and Abdou Louarti, pers. comm.). Berber and Mauritanian metal jewelry can also be confused with Tuareg adornment, although the latter are usually with less embellishment. While Tuareg jewelry is prominent in the marketplace and their smiths have high visibility (Benesh-Liu and Liu 2007, Bernasek 2008, Cheminée 2014, Liu 2017), their work has been largely ignored in the excellent French literature on Maghreb jewelry. Camps-Fabrer (1990) shows only one page of Tuareg jewelry, while others in the Édisud series have no coverage, and the recent extensive collection of North African jewelry (Chakour et. al. 2016) also does not include Tuareg work. This article only covers amulets/tcherots/kitabs, crosses and some rings, a very limited representation of the Tuareg jewelry repertoire and examples made by Mauritanians or other Berber peoples. TRADITIONAL OLD TUAREG SHELL AND LEATHER HAMSAS. Niger, one has been embellished with green-dyed leather and red vinyl threads and strung into a contemporary-designed necklace of coral, stone beads and carved conus shell disks. One of the hamsa pendants has grooves on each of the five shell pieces; hard to determine if these are natural features or carved. Other shell squares are ridged in middle. The five geometric shell pieces are an abstraction of the five fingers or hamsa. Fisher’s photo (1984: 206) demonstrates their ubiquity among Niger Tuareg women. Courtesy of Ethnic Embellishments. TRADITIONAL TUAREG SHELL AND LEATHER HAMSA OR KHOMESSA. Algeria, acquired in 1994: of shell and leather, it is strung on a thick cord wrapped with glass seed beads and leather. A very similar example is shown in Leurquin (2003: 54). The pendant is 10.2 cm wide and the shell has not been identified, possibly Arca? This type of pendant is also made in metal, of a silver alloy; Bernasek (2008: 11) states they are worn by Tuareg women in the Algerian Sahara. There are also pendants where a triangle is joined to a modified hamsa, both antique (Leurquin 2003: 54) and new, as seen on the last page of this article. The making of a popular form of an object in various materials is known as transposition (Liu 1995b). Courtesy of J. Busch. Angela Fisher (1984: 194) perhaps best summarized how intensely Tuareg smiths feel about their work, while referring to a padlock one had decorated: “For you this is as small as my thumbnail, for me it is huge. Look—there is the ant, the hyena, the jackal, the horse’s hoof, the moon, the stars and the sun, the good eye, the woman... the devil’s eyebrows, the laughter... that’s our life.” In many ways, she expresses well the conundrum when someone outside of a culture looks at their material goods, whether it is ancient, ethnographic or contemporary jewelry. The observer brings her or his knowledge and aesthetics to understand and evaluate, but usually lacks enough information to truly understand all the symbolism and the deep meaning that the jewelry imparts to that culture. This is especially true in cultures, like the Chinese, where not only the motifs all have symbolic meaning, but their combinations also become phonetic rebuses, further adding to the difficulty in deciphering for outsiders (Bartholomew 2006). LARGE BOGHDAD CROSS PENDANT AND SMALL MOROCCAN BERBER BOGHDAD. The former are old and most likely from central Mali, Tuareg territory; not soldered but riveted silver. The Berber boghdad is also silver, old and from southern Morocco. Both of these antique crosses are very similar to the Trarza examples shown, although neither have wood backing. NEW BOGHDAD CROSS PENDANT. Niger, of brass and leather, showing mix of traditional Tuareg jewelry with modern appeal. Obverse and reverse: reverse has hallmark/signature of the maker. Courtesy of Ethnic Embellishments. OLD SILVER PENDANTS. Niger, open-work/pierced pieces, these were normally sewn onto the front of a leather kitab or amulet, holding verses for the Qur’an and/or other protective writings, and worn as a necklace. Small tisek rings at top middle with agate or carnelian made in Idar-Oberstein: these were woven into women’s hair as ornaments: old, Niger, also Mali. Small silver and metal hair ornaments on a string are mostly from Niger. Many of these are a stylized form seen in North African jewelry of the Punic goddess Tanit, with a triangular shape topped by a circle, sometimes with a horizontal line where the circle and triangle meet, like arms. Courtesy of Ethnic Embellishments. Gabus (1982) and Cheminée (2014) provide excellent comparisons and contrasts of how Tuareg smiths work in the late twentieth and early twenty-first centuries, through the former’s wonderful sketches by Hans Ernie and the latter’s photographs and interviews. Tuareg smiths have changed very little in their work processes or their tools and equipment. All still work while seated on the ground, often using a forked piece of wood as the work surface, with a square anvil (in contrast to horned anvils used by other North/West African jewelers) pounded into the ground. Both hands and feet are used, the latter to hold or steady the work. A leather bellows is still used to increase the heat and all their tools usually fit into a small box. They cast (lost wax or sand molds), forge, solder, pierce, surface decorate with gravers/punches and cold-connect. Their forging, filing, engraving and punching (with home-made tools) are superb, as well as their ingenious cold-connecting and use of a very large assortment of metals, wood, leather, and plastic. All the engraving is freehand, without an engraver’s block. Their forging skills, utilizing only the small, square anvil and a typical short-handled, heavy hammer, produce impeccable results, especially in older pieces. If one looked closely at the knobs and bosses on their tcherot or crosses, they all are uniform and finely varied. Some are slightly flattened, others pointed or filed into precise, geometric shapes. While silver is the preferred metal, copper, brass, white metal and steel are all utilized, to add color and vitality, much like how Western jewelers use colored golds. Whether precious or base metal, one does not see a difference in the level of workmanship. Their practice of combining different aspects of their design motifs and components into countless variations adds greatly to their vitality. 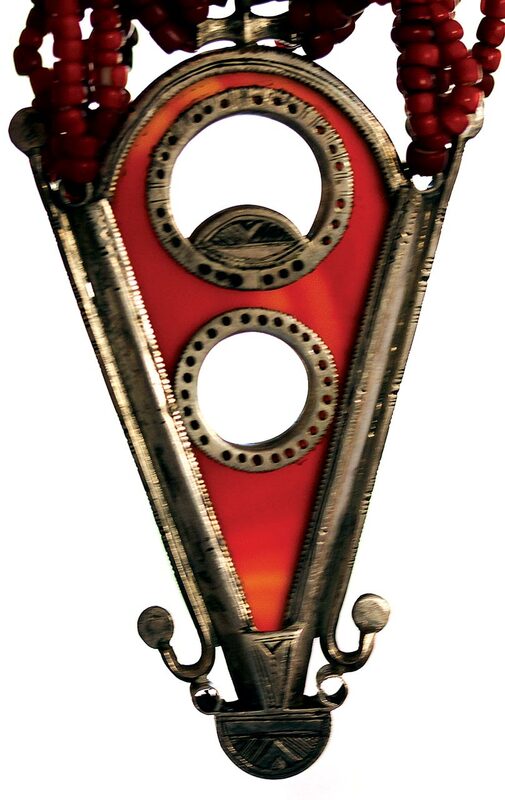 Perhaps unique among African jewelers, Tuareg use imported Idar-Oberstein agate ornaments in an innovative and pragmatic manner, utilizing damaged or broken portions of talhakimt/talhatana, set in metal rings and pendants, as seen in examples on this and opposite page. Tuareg smiths utilize great hand and mental skills, and with a few simple tools produce wonderful ornaments. Truly, while their work is small, their skills and vision are large. OLD CROSSES FROM NIGER. Silver on top with colored vinyl underneath, backed by aluminum. These demonstrate the Boghdad cross motif that ranges from Morocco to Mauritania and east to Niger. While some of the shapes are similar, these differ considerably from the Mauritanian crosses of Trarza shown. Note the use of red and/or green on these crosses, as well as those on the Crosses of Trarza and the Hamsa necklaces. Photograph by and courtesy of Ethnic Embellishments private collection. CROSSES OF TRARZA. Mauritanian, of silver/silver alloy, on ebony backing, with suspension loops of copper wire or the wood backing drilled width-wise. Wood is prized in Mauritania (Leurquin 2003: 57). Some crosses are inlaid with plastic or have additional shaped elements of plastic. The cross with filed geometric red plastic element also has beautifully worked pyramidal elements, besides the round balls. The engraved silver is attached to the ebony via rivets, the heads of which are the silver balls. Some of these may have been made in Boutilimit Province but Gabus (1984: 102-103) shows similar examples from Medérdra, Mauritania. The crosses are either strung on cord, twisted leather or multiple strands of leather/cord. These range from 3.9 to 6.1 cm high, excluding loops. Courtesy of J. Busch. TUAREG AND MAURITANIAN JEWELRY, INCORPORATING EUROPEAN IMPORTS. Upper left shows assortment of Tuareg rings and pendants that incorporate broken or damaged Idar-Oberstein carnelian talhakimt, as well as an undamaged example, to show which portions are utilized when broken or damaged. Two can be used as rings, while the others are often seen strung on necklaces. 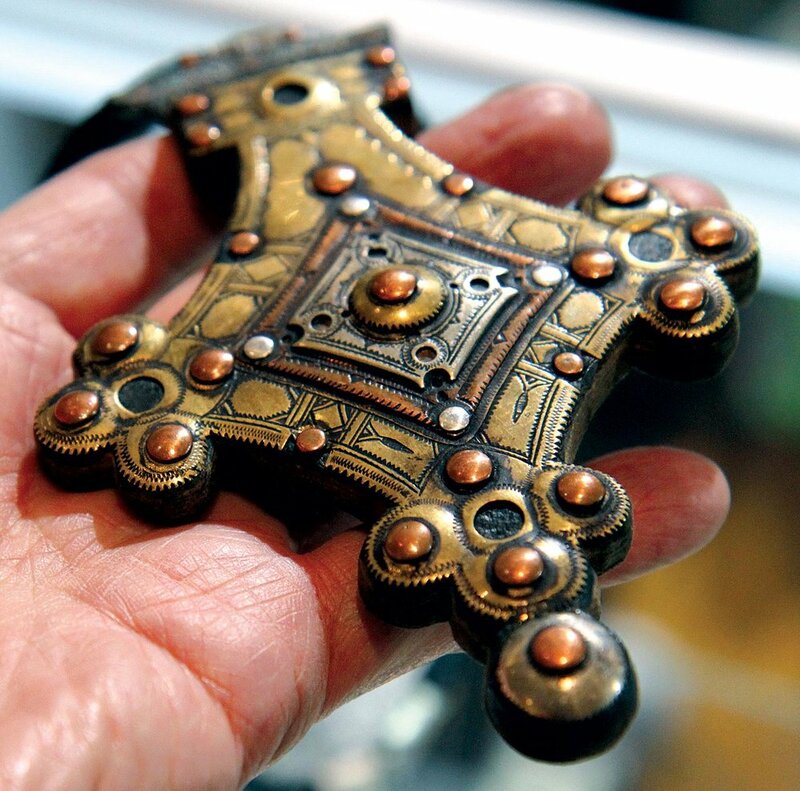 The largest example is made as a pendant and is beautiful metalsmithing, with layers of copper/silver on the geometric bosses and finely punched decoration, 14.2 cm long. The small silver ring utilizing the broken top of a talhakimt is known as a tisek ring. The seemingly intact carnelian pendant wrapped in metal is actually cracked; it is similar to the two strung as pendants on the Mauritanian necklace to the right. The elaborately set talhakimt in the center, shown in reflected/transilluminated light, is very unusual; it appears to have a second hole drilled into the stone portion, with both openings ringed by silver. The Mauritanian necklace to the right is a very rare example of using human hair for a necklace; it has carved conus disks and Idar agate pendants, heat-treated red and dyed green ones, with a pendant of Mauritanian gilded metal beads, amber (? ), Idar agate drop pendants and an Engina shell dangle. The carved conus shell disks are used by Tuaregs for their tcherots (Leurqin 2003: 55) and by Mauritanian Moors (Gabus 1982, Liu 2008). The silver transposition is also seen in aluminum. Further information can be found in Liu (1995a, 2002, 2008). Courtesy of the late Rita Okrent, Elizabeth J. Harris; David Spetka of Niger Bend, Brinley Thomas, J. Busch/G. Kerschna, Joe Loux, and Frontiers. 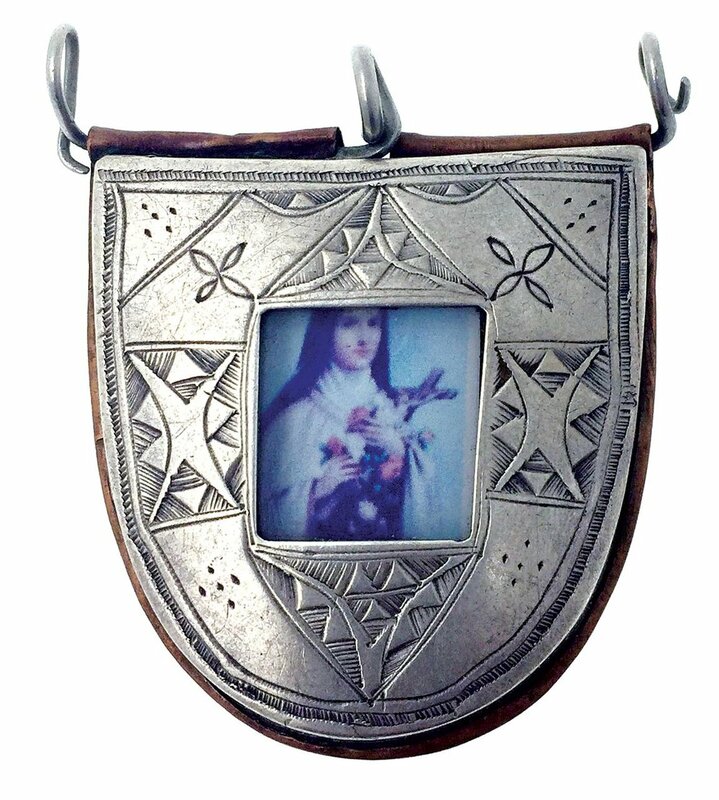 TUAREG AMULET OR TCHEROT WITH IMAGE OF THE CATHOLIC SAINT, ST. THERESE OF LISIEUX. An older piece of silver, white metal and copper; the image is original to the piece, so it was probably custom-made. She is a patron saint of missionaries, and there were Catholic missionaries in Southern Algeria and probably in Niger as well. OLD AXE-SHAPED AMULETS. Most likely from the Mauritanian/Mali border region. Silver alloy or white metal, copper and brass, with bail or loop riveted to the amulet, also done with amber beads in Mauritania. Neither of these amulet types have previously been published. Photographs by and courtesy of the private collection of Ethnic Embellishments. CONTEMPORARY VERSION OF TRADITIONAL TUAREG HAMSA/KHOMESSA. Niger, fabricated, of brass, copper and leather. It is the melding of a triangular amulet and a doubled hamsa, although with two more elements, so as to make the design symmetrical. Both the triangle and hamsa offer protection. While this pendant is new and in base metals, there is still a good level of crafting. Courtesy of Ethnic Embellishments. OLD TUAREG RINGS. The left is a talismanic ring from Niger, the center is a “mosque ring” from Mali; the right is a Fulani playing card motif fused with a Tuareg tisek ring and lastly a man’s tisek ring in the middle. Compare to the tisek ring on top left of opposite page; these all use broken portions of Idar-Oberstein agate talhakimt. Note inlay of copper in right-hand ring. Photograph by and courtesy of Ethnic Embellishments. AGATE AND MOLDED GLASS TALHAKIMT, TALHATANA AND TURMRINGS. 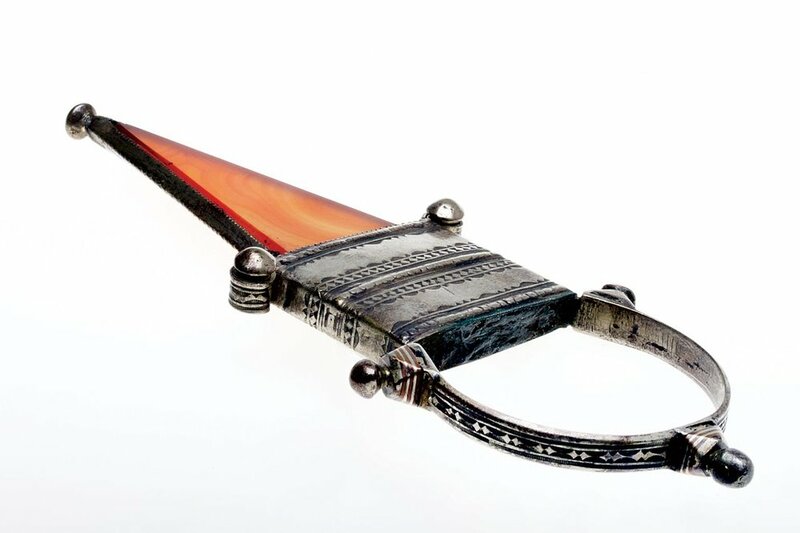 1.7 - 7.5 cm long: the oldest are the Indian made agate/carnelian talhakimt (the tall triangular type in pale agate) and talhatana (short triangular type) on the bottom right-hand row, from an ex-museum collection. While these reached West Africa via Mecca (Fisher 1984), and have been discussed by Gabus (1982) and Liu (1977) as to their being the prototypes of European copies in stone and glass, they have never been found in a Tuareg jewelry context, nor the much later German celluloid example, second from right top row or the German agate turmring type (1960s) next to it. Most used are the large agate talhakimt (white pre-1960, red 1960s) and the shorter talhatana types, also on right-hand side of top row. See Kaspers (2018 this issue on dating such agate ornaments) on the Idar-Oberstein industry that made these ornaments. German and English terminology for these ornaments differ (Kaspers 2018, Liu 1977). The smaller talhatana, in either heat-treated or dyed forms are usually worn in the hair, but not by Tuareg, as are the small, molded Czech/Bohemian glass ones. Large Idar talhakimt are also worn by the Dogon, and the larger glass ones in Malian necklaces. Courtesy of the late J. L. Malter, R. Okrent, P.W. Schienerl; Abrima, the Picards, T. Stricker, L. Wataghani, and the Heimat Museum, Idar-Oberstein. I thank Hillary and Abdou Louarti of Ethnic Embellishments for their informative identifications and comments about Tuareg jewelry, as well as permission to use images of pieces from their inventory and unique private collection and for their excellent photographs. 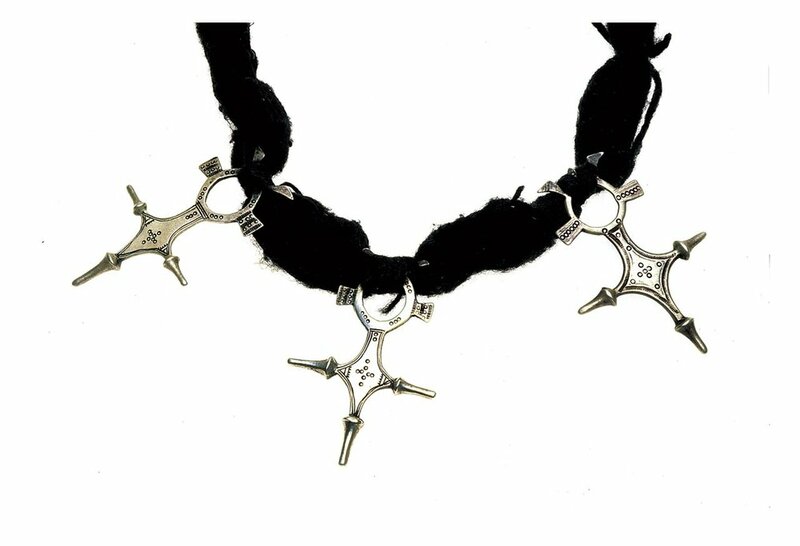 Our study collection of Tuareg jewelry purchased in 1994-95 from Jürgen Busch and Gudrun Kerschna, as well as their gifts, have enabled me to more closely study the personal adornment of this culture. The jewelry shown in this article were documented from the mid-1970s to now. I am very grateful to Dr. Jan Fahey for obtaining a copy of Gabus’s superb 1982 reference on the Sahara for our library; it remains the definitive work on Tuareg jewelry and techniques, covering mid-to-late twentieth century French expeditions. Benesh-Liu, P.R. and R.K. Liu. 2007 Museum News: The Art of Being Tuareg. Ornament 30 (3): 70-72. Bernasek, L. 2008 Artistry of the Everyday. Beauty and Craftsmanship in Berber Art. Peabody Museum Press, Harvard University: 125 p.
Camps-Fabrer, H. 1990 Bijoux Berbères D’Algérie. grande Kbylie-Aurès. La Calade, Édisud: 139 p.
Chakour, D. et. al. 2016 Des Trésors à Porter. Bijoux et Parures du Maghreb. Collection J.-F. et M.-L. Bouvier. Paris, Institute du monde arabe: 160 p.
Cheminée, M. 2014 Legacy. Jewelry Techniques of West Africa. Brunswick, Brynmorgen Press: 232 p.
Creyaufmüller, W. 1983 Agades cross pendants. Structural components & their modifications. Part I. Ornament 7(2): 16-21, 60-61. — 1984 Agades cross pendants. Structural components & their modifications. Part II. Ornament 7(3): 37-39. Fisher, A. 1984 Africa Adorned. New York, Harry N. Abrams: 304 p.
Gabus, J. 1982 Sahara. bijoux et techniques. Neuchâtel, A la Baconnièré: 508 p.
Kalter, J. 1976 Schmuck aus Nordafrika. Stuttgart, Linden-Museum Stuttgart and Staatliches Museum für Völkerkunde: 120 p.
Leurquin, A. 2003 A World of Necklaces. Africa, Asia, Oceania, America from the Ghysels Collection. Milan, Skira, Skira Editore S.p.A.: 464 p.
Liu, R. K. 1977 T’alhakimt (Talhatana), a Tuareg Ornament: Its Origins, Derivatives, Copies and Distribution. The Bead Journal 3 (2): 18-22. —1987 India, Idar-Oberstein and Czechoslovakia. Imitators And Competitors. Ornament 10 (4): 56-61. —1995a Collectibles: Mauritanian Amulets and Crosses. Ornament 19(1): 28-29. —1995b Collectible Beads. A Universal Aesthetic. Vista, Ornament, Inc.: 256 p.
—2002 Rings from the Sahara and Sahel. Ornament 25 (4): 86-87. —2008 Mauritanian Conus Shell Disks. A comparison of Ancient and Ethnographic Ornaments. Ornament 32 (1): 56-59. —2017 Ethnographic Arts: Jewelers at the International Folk Art Market. Ornament 40 (1): 62-64. Loughran, K. and C. Becker. 2008 Desert Jewels. North African Jewelry and Photography from the Xavier Guerrand-Hermès Collection. New York, Museum for African Art: 95 p.
Schienerl, P.W. 1986 The Twofold Roots of Tuareg Charm-cases. Ornament 9(4): 54-57. Van Cutsem, A. 2000 A World of Rings. Africa, Asia, America. Milan, Skira: 230 p.
Robert K. Liu is Coeditor of Ornament, for many years its in-house photographer, as well as a jeweler using alternative materials like bamboo and polyester. 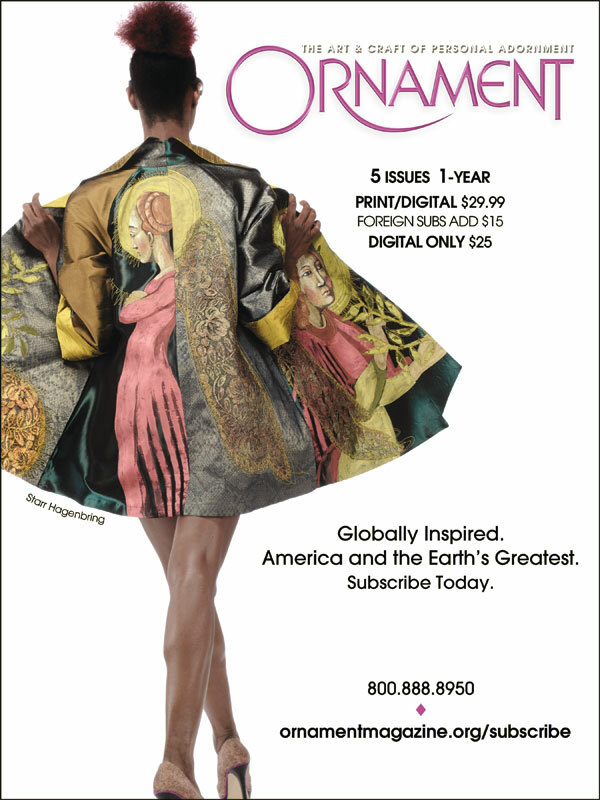 His recent book, The Photography of Personal Adornment, covers forty-plus years of shooting jewelry, clothing and events related to wearable art, both in and out of the Ornament studio. A frequent lecturer, some of his topics include precolumbian jewelry, prehistoric Southwest jewelry, ancient Egyptian jewelry, and the worldwide trade in beads. In this issue Liu discusses some aspects of Tuareg jewelry, based in part on the inventory and private collection of Ethnic Embellishments.